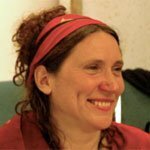 Gina Cenciose is a lively and passionate CNVC Certified Trainer who works with groups, individuals and organizations in English and in French to fully integrate the change of consciousness NVC calls us to. She also implements Dominic Barter’s system of Restorative Circles at every opportunity, and she is currently supporting an organization of 400 employees in establishing a culture of nonviolence by doing ongoing NVC programs, Restorative Circles trainings and in training Restorative Circles facilitators. She has been a student of Restorative Justice for many years. Restorative practices and Restorative justice have been a major focus in Gina’s life, and she has received intensive training in Shamanism, Meditation, Spirituality and Focusing. Gina has implemented NVC at a veteran’s hospital, and in the framework of a social change program with young mothers and their children, in a year-long government funded program, NVC being the main teaching part of the program. She works closely with the International Center for NVC, as a certifying coordinator. Gina combines NVC with Meditative Inquiry forms (such as THE WORK) and Inner Relationship Focusing in many of her year-long programs, and is co-founder of Eastern Canada’s Restorative Circles Family Network, as well as different networks for NVC in the East. Other passions include music (she offers singing and movement in the fabric of all of her work), dancing, gardening and nature!